The U.S. Powerboat Show is officially over, and the yachts headed to the Ft. Lauderdale Show have cast off their lines and gone south to make the next move-in deadline. With a deep breath, I stop and think back on the shows that have taken place in the last month. The Bay Bridge Trawler Fest was the start of the show season in Annapolis, and the boats there represented some of the current offerings in the trawler market. I'm sure the PMM folks will give a full report. Then we had the U.S. Sailboat Show, the largest sailboat show in the world. It was packed with people, positive energy, and some pretty cool sailboats. Even at a time where sailing is not growing to any great degree, the boats were as varied as they have ever been, and the cruising choices were greater than every before. Unpainted aluminum boats for high latitude cruising from French builders held one end of the spectrum, while many catamarans seemed to dominate the other end of luxury sailboats that promise liveaboard comfort like never before. Between those two extremes were many, many monohull sailboats, ranging from small dinghy and racing boats to the lavish accommodations of an Oyster 74. If you are interested in a cruising or racing sailboat, this show is a must-see. And it brings into town sailors from around the world, and all the big names in sailing. Crowds waited to go aboard the many boats. 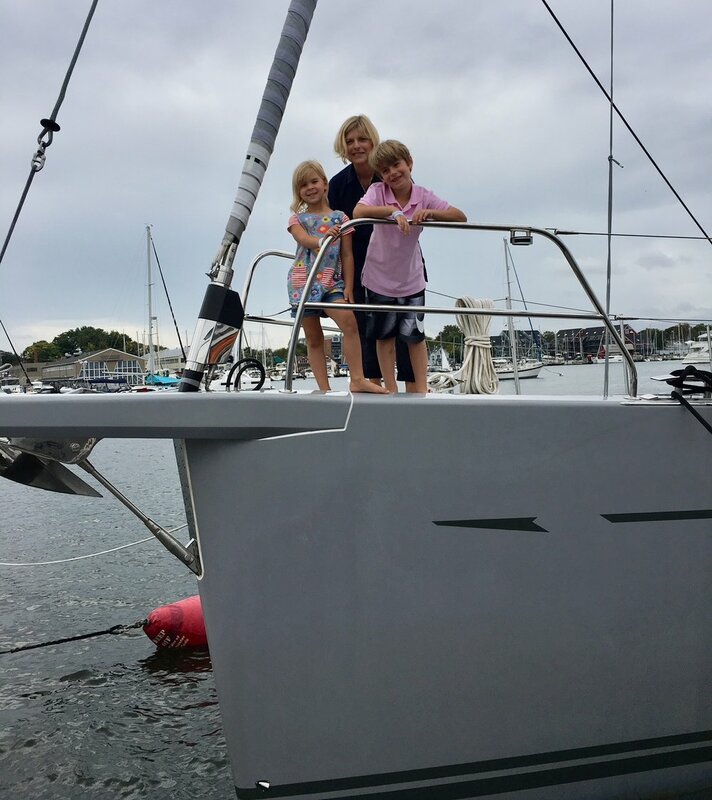 This new Boreal 47 belongs to Charlie Doane, editor at Sailing. A very cool boat, well suited for high latitude sailing among the bergy bits. My nephew said he will go crazy if he doesn't own an Oyster 74. Would you settle for a Flying Scot to start off your sailing career instead? The powerboat show had plenty to see as well, even if the trawlers weren't as numerous as years past. But the big takeaway from this show for me was the number of manufacturers who now offer outboard-powered cruising boats, some exclusively. Even my own Hunt Harrier now has a big outboard on an extended swim platform. The new MJM 35 is also configured this way, as were numerous other boats normally found with diesel inboards. Bob Vincent of Endeavour Catamarans told me at Trawler Fest the outboard alternative eliminates many design and construction issues, with no need for stuffing boxes, rudders, and the systems required for inboard power. And the outboards can be raised out of the water when you are not running the boat, so the running gear stays clean. The Hunt Harrier with a Yamaha outboard. The look is different. The modern technology of today's outboard engines offers an attractive package and there is much to recommend it. Seeing gasoline return as the fuel of choice is a bit of a surprise, but Yanmar’s recently announcement of a new line of diesel outboards is a sign that perhaps the era of diesel outboards in on the horizon. Not sure I would expect to see a Fleming 55 with three or four outboards for power, but for many other boats, this may be the way to go. Modern outboards are economical, quiet, have outstanding emissions control, and represent state-of-the-art propulsion systems. The Hinckley Dasher is an electric cocktail cruiser using two Torqeedo inboard motors. This is a high-tech powerboat. And there is no wood on this boat, despite what you see. The ultimate illusion. But it is the people who make the show for me and it was great to see so many at the shows, The brokers and company reps have certainly changed over the years, and many of the men and women we worked with at PMM days are long gone, retired or moved on to other things. But some faces remain, and there is always fresh new talent to take over the challenges of the recreational boating scene. Sitting on a Hallberg-Rassy at the sailboat show, I chatted with a young woman helping move the boats in and out of the show. Emily is from Duluth, Minnesota, now living aboard a Bob Perry-designed Saga 43 sailboat with her husband and young daughter. She writes a food blog, sailingthebakery.com, and is living the cruising dream with her young family. I also ran into Behan Gifford of Sailing Totem fame, sailingtotem.com, a cool and energetic free spirit whose family is all about the adventure and experience of cruising the world on a boat. They hail from Bainbridge Island, Washington, and she and her family are friends of Brian Calvert, the wanderer on Further, a Selene trawler now based in the Philippines. Brian was the Selene dealer in the Pacific Northwest for many years until he chose to do it himself. It really is a small world of cruisers, as we keep running into friends of friends. 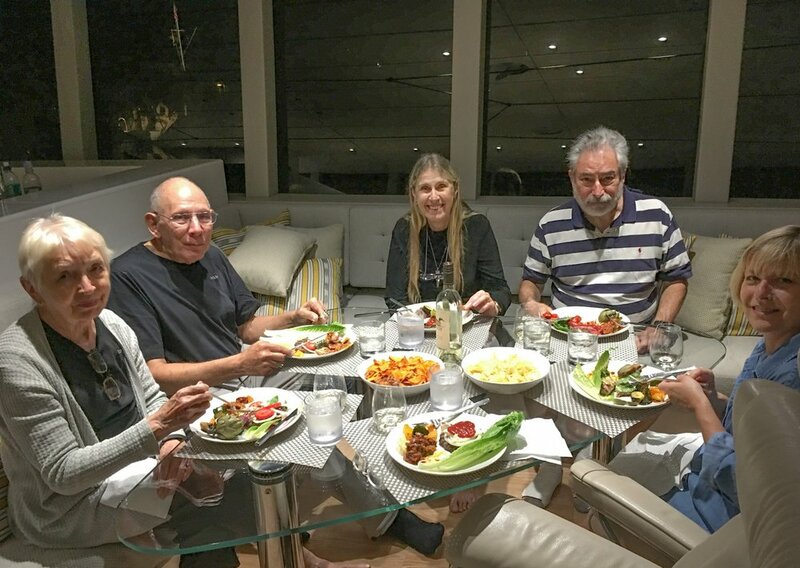 And, of course, having FPB 78-1 at our docks is a great opportunity to catch up with Steve and Linda Dashew, and also get to know their Tucson friends, Michael and Nancy Morrell. The Morrells finished their circumnavigation in 2006, taking a full 16 years to circle the globe aboard their Norseman 447 sailboat, another Bob Perry design. (Mr. Perry has designed a lot of great cruising boats!) Explaining why it took so long to go around the world, they said they chose to immerse themselves in the many cultures they visited as they preferred to become part of the local community. Michael is an orthopedic surgeon, and volunteered his services, practicing his surgical skills in many of the places they visited. In the cruising world of movers and stayers, Michael and Nancy are definitely stayers. Steve Dashew shared their recent decision to end their boat building activities, and focus on cruising as they can with family and friends. Their spectacular FPB 78-1 represents a lifetime of experience, knowledge, and thinking out of the box. Our neighbor friends who toured the boat were simply blown away by the details and creativity that Cochise embodies. I have lots of video and photography to sort through, and will post more on this site soon. As it has been for many years, the fall boat show season in Annapolis remains a celebration of the cruising lifestyle, and a great chance to see the people out there doing it, who come together this time of year. And it doesn’t matter at all whether you are a cruising sailor or you are on a trawler. Older PostSo What is a Trawler, Anyway?